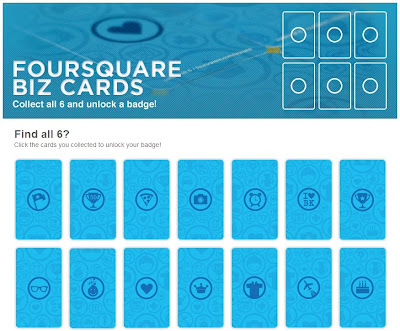 Ok, I've never shared how to unlock badges on Foursquare. Since people are always stalking me to ask about how because obviously I'm a Foursquare freak, let me say this first before I get on this tutorial for a badge that has been elusive for some time. 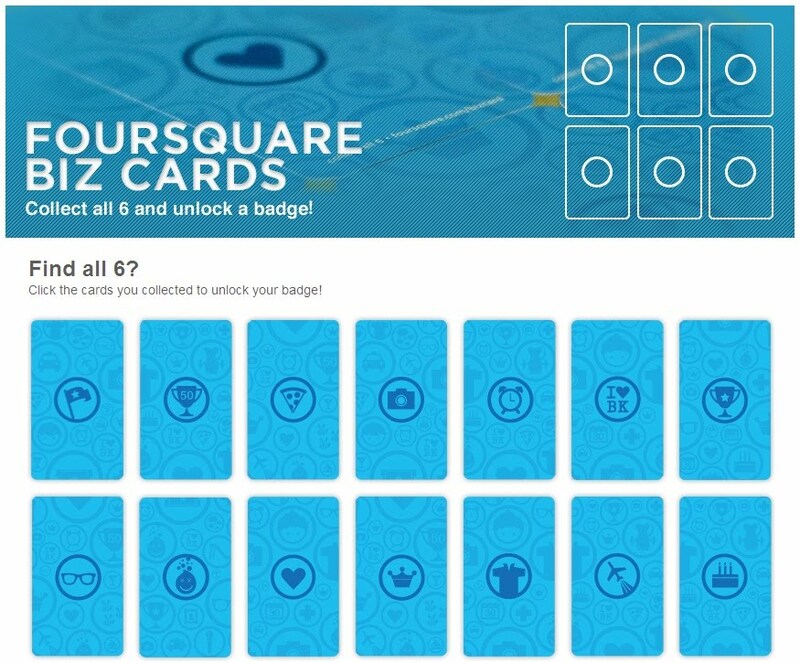 The challenge of getting badges for me is the real thrill of using Foursquare. At this point, if anyone has to ask what is Foursquare - damn you and Google it lah. Ok, the badge I'm going to help you guys unlock is one that is considered extremely hard to get. It took me forever to get the clues to unlock this one. Thus the value of this information. If you don't want to know how, don't read on. But it's doubtful you can unlock this on your own otherwise, since this badge was introduced during SXSW 2010 (that's the South by Southwest music festival). And most of you not reading this might never get it. See it was called the Groupie badge because apparently at the event, you had to collect the business cards from people that work at foursquare. Each one has a different symbol on the back and there are 6 different symbols. Once you get all 6 you go to a special site and put them in and then you get the badge. First of all, CLICK HERE to get to the Foursquare Biz Card page which should look like this. You must be Java enabled obviously. And already logged in your Foursquare account page. Now, you have to click the cards with the badges on it - IN SEQUENCE. The sequence should be in this order that you have to click. 7. 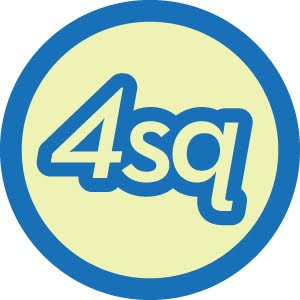 Get the 4sq Groupie badge! Simple isn't it? Please leave a thanks here in the Comments if you got the badge... and do let me know if you want to know how to unlock other badges. I'll try and help out what I can. Maybe aku boleh keluarkan a whole list with specific instructions? 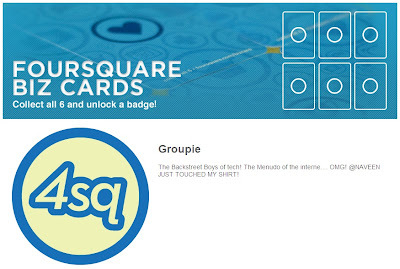 To add me on Foursquare or just stalk me and see what badges I have - CLICK HERE. We now resume the regularly non-Foursquare related rantings.. heh! I've managed to unlock it! thanks! bro that was awesome... my main drive in foursquare is to unlock those badges but so dissapointed that most are geographically allocated. would love to know more from Mr. Foursquare himself. so whadya say?? congrats guys. nice to know i could help. let me consider it. follow my twitter and i will announce more ok. or just pop in here to check out things;. Joe,got my badge..thanks! and i went to ur territory just now.. rasta TTDI! :D take care! Damn easy when one knows how! Thanks dude, post more please! THANK YOU! This has been driving me MAD (^_^) YOU ROCK! thanks... u got so many badges... hehehe. i can't even unlock my newbie badge. hahah. thanks for adding me as fren in foursquare!! thank u! this is so exciting! can't wait for more post from u! everytime is select the 6 cards its says , you sure you have seleceted the right ones? ,this isnt a guessing game you know?